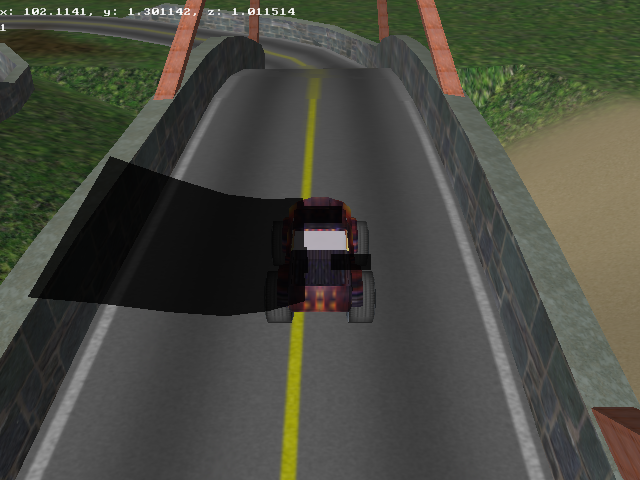 There are some things that need work, but here's a demo of the racing game I'm working on. There is only one vehicle and one track right now, but I'd like to get some feedback on the general feeling of it. Thanks! It's too hard to turn left or right and you crash way too easy. I'm sure you will sort that out . Edit: I just saw something really really wrong with the shadow of the tires. It looks like they are moving all over the place . Didn't happen the first time I tested it. Yes the shadow is a bit weird. 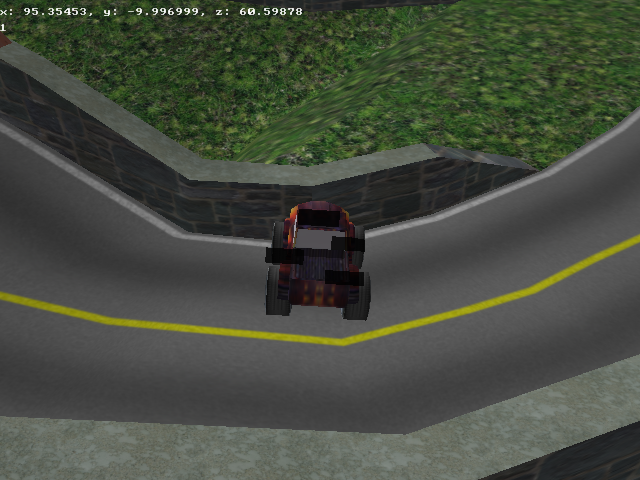 Also, I fell off the edge, and when I pressed SPACE, the tires fell off ! How do you do all the collision checking? Damn, I don't get that man. I think it might be a bug with the nVidia driver. Nothing ever goes wrong here, but when I updated my driver the other day, I can't run *anything* full screen that's below 640x480, where I used to be able to go all the way down to 320x200. Tusike, Newton provides the contact position, normal, velocity, etc... you just decide what to do with it. By the way, can one of you guys get a screenshot of this please? Thanks, Phycowelder. Does everything look ok for you? Wow, that's totally borked man. This is what it's supposed to look like.. I have no idea what could be wrong there, as the bound texture unit on the walls is not even the correctly bound texture. If I post a patch exe, could you try that? Try e-mailing me the rar: varnaipeti@hotmail.com. I think you should only e-mail everything besides the images, otherwise it will take a lot of time to attach the whole folder. Maybe the file-hosting somehow corrupts the exe. I heard of something like that before, and it happened to me. Could you find another host for this file? I'm having some huge and annoying problems with surfing for the last three days, but only with loading up websites (really weird). So if I get a direct link and the downloading starts, I can download fine. You know how much crap MediaFire gives you before it allows you to start a download. i tested it almost 20-30 times! the steering is hard though! almost Rally style, but i asumed that was 4 a reason! Well, I finally downloaded. It's barelly playable on my PC with lowest settings. What happened with the FPS counter? Anyway, the steering IS way too difficult right now. And it doesn't seem to be that the camera is following the car always properly. Well, it doesn't surprise me that it doesn't run right on the integrated gfx card. Those things usually have horrible OpenGL support. I'm still tweaking the physics, and trying to find a solution for those of you who have trouble with the stencil buffer. Thanks. I think the camera should be positioned a bit lower. I like to use two points to run my cameras, one for the actual position and one for the desired position. Each frame I'd update the desired position and then move the actual position towards that at a controlled rate. It results in a much smoother camera movement and also tends to avoid a lot of quirky problems with directly computing the camera position. I tend to lose traction EASILY when trying to brake using Down. It might work better if you have down act as Brake when the velocity > 0 and reverse when it's <= 0 (and vice versa for Up).